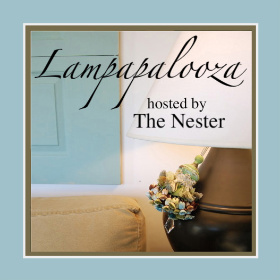 Welcome to Nester’s Lampapalooza Party! Now you can’t have a party name like that and not be excited! Honestly, even my husband is excited about this post because I’m actually showing off some of his work too. Below are an assortment of my favorite lights. Enjoy! 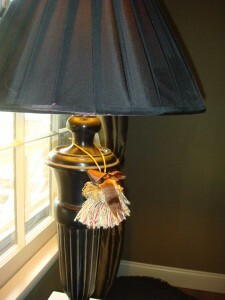 This was one of the two tassels I purchased during Nesters crazy Tassel Sale a couple months ago. This was the first one I selected and I’m so glad I did. 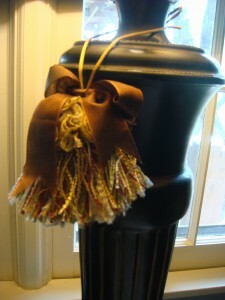 I just love looking at this tassel in the living room. It sits so pretty on the lamp and it’s bow is my favorite part. Truly, the lamp was naked without it! I love the white on white and how the crystals hang and reflect the light of the lamp. 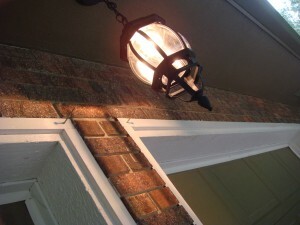 We recently painted our exterior and replaced the UGLY motion detector light with a lantern from Home Depot for only $24.00. Now this might look like a regular pool table light but these lights have seen some major history, and I’m not talking about the games that have taken place at our table! We live in Lawrence, Kansas and college basketball is just a tad bit of a big deal here. We are, and always have been huge KU fans. So when a friend offered my husband, David, a friends and family pass to a sale at the Allen Field House the other day, he was all over it. Let’s get one thing clear: my husband is opposite of me with the second guessing thing. He is down right impulsive when it comes to purchasing so I knew this sale was going to be like feeding candy to a baby. I will not bore you with all the KU items he purchased but no one could miss the HUGE box of lights he brought home. These lights were dusty, dirty, but don’t forget…they had HISTORY. (We don't know there exact location - but were going with concourse lights). The man has vision and he knew exactly what he wanted to do with 3 of these lights. First he rewired them with new electrical wire, ran the wire through standard water piping that he picked up at the local hardware store. 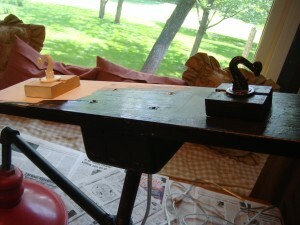 He also bought some connectors and voila…a masterpiece! How great is that?! But he still needed to fabricate a mount which consisted of a standard electrical junction box that fastened to a piece of leftover door trim from a previous project. A couple of hooks and coats of black paint cleaned this baby up nicely. Next he bought a swiveling, self anchoring mounting hook and hung with a chain from a standard ceiling fan swag kit at Home Depot for only 4 dollars. (Do I sound like I know what I’m talking about? Good because David has been dictating to me this whole thing! Except I have added in the ‘voila’, ‘masterpiece’ and ‘cleaned this baby up nicely’ statements. Really all I did was paint and take pictures). A year ago, David was craving an expensive KU bar light. Now he has created a story and a historical light for less than $30 with his own two hands and that can be passed down for many years to come. I am so proud of him and constantly amazed how he brings his talent and passion to better so many parts of our home. Lampapalooza Lamp Makeover update!! This is the best part of these parties - so much inspiration. And there were a couple of my lamps that needed it so they are in a makeover session right now and one has already been completed. 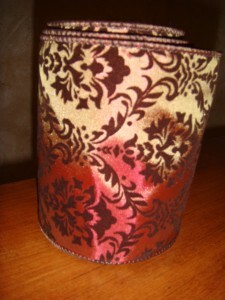 I so loved the lamps that had ribbon or fabric draped around them and tied. And when I saw Amanda’s I knew what I needed to do. Now this is the crazy part - I have had this ribbon since I bought it after Christmas as one of those - love it but don’t know where to put it - purchases. So in the middle of breakfast, and my husband asking me, “What are you doing?” I did this little 2 minute makeover. Fab! Thanks all you Lampapalooza party people! Katie! You and David did a great job! I LOVE those vintage lights! And the way they are mounted is brilliant! Well done! Wish I had them for my son’s room! Wow, I am impressed at a man with a vision and the umph to carry it out! I love the way they look! Thanks ladies! My husband is glowing!! Correction: I mean beaming…Do men glow? Your lamp accessories are so cute! 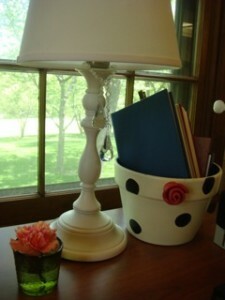 I just love the vintage lamp makeover! 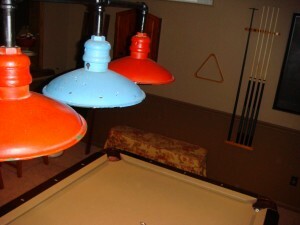 I am in LOVE with those pendant lamps above the pool table. They are awesome! Kudos to you and your ingenious hubby on that one! And thanks for the shout out on the ribbon wrapped lamps. 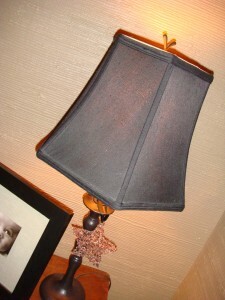 It really makes such a difference and totally personalizes plain lamps. Yours turned out beautiful! For real??? Straight from Allen Field House!?!?! Why don’t I remember those from my visit? Well, I will have much more appreciation for them when I see them next time! I love the KU lamps! We live in the little state of South Carolina and my husband is a huge Gamecock fan. The only thing that we’re really good in on a national level is baseball. Still. My husband would go crazy over an opportunity like that! What a beautiful job you did with the ribbon and the lamp. Love the tassels and all your lamps. I missed the tassel sale, so sad about that one. What a great idea for history & sports theme your hubby came up with. That is just brilliant! Oh my word. I ‘m having serious envy of those vintage lights. They would look perfect in my kitchen! Love what you did. I love your new outdoor light. 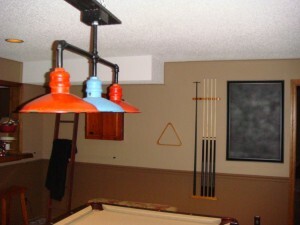 The lights over your pool table are so cool, especially since they have history. I love the story behind the lights! 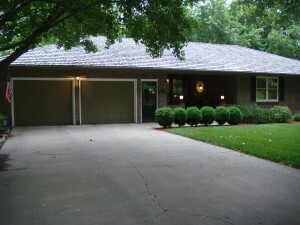 You did a nice job of fixing them and love the nester tassel. I got one during the sale, too. Couldn’t resist. 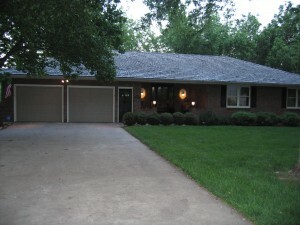 Tell your hubby he did a great job on the vintage lights. 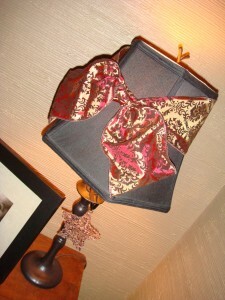 I also love how you tied the bow on the lamp in the last photo. Oh wow! Your husband IS brilliant! That is amazing, historical AND practical. Beautiful 2 minute re-do on your part, too. You’re right, those vintage lights DID turn out to be a masterpiece! Amazing job!!! Hey Katie. 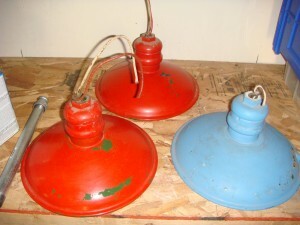 Do you have any more of those KU lights, or know where to find more? 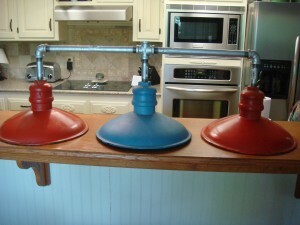 i really want 2 red ones for over our kitchen bar top. I LOVE the look!